Hot Holiday Toy Sale - up to 60% off! Free shipping at Boscovs.com with $50 purchase! 18" Harvest fruit turkey platter - $4.97! Free gift with any $21.50 Clinique purchase. Availalble online. $50 value! Extra 15% off all children's apparel at Boscovs.com! Extra 15% off all mens and young mens apparel at Boscovs.com! Extra 20% off all women's apparel at Boscovs.com! Extra 15% off lowest prices for Father's Day at Boscovs.com! Extra 20% off all ladies accessories at Boscovs.com! 20% off Fisher Price Toys at Boscovs.com! Isabella beaded set of 3 gravy boats - $4.97! Extra 15% off all shoes for the family at Boscovs.com! Harvest fruit set of 3 gravy boats- $4.97! Extra 15% off almost all handbags & wallets at Boscovs.com! Extra 15% off lowest sale prices Ladies Easy Spirit Shoes at Boscovs.com! Extra 20% off on gifts for Dad for Fathers Day at Boscovs.com! Shop for Jewelry at Boscovs.com! Shop for Electronics at Boscovs.com! Shop for the Kitchen at Boscovs.com! Shop for Kids at Boscovs.com! Never miss coupons from Boscovs! 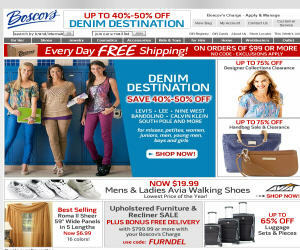 Enter your email below and we will send you the latest and greatest Boscovs deals. Boscovs.com Department Stores - Boscov's Online - Your Full Service Department Store - Boscov's department store, a retail company located on the east coast, is focused on bringing the latest styles and trends in fashion and home decor to our stores for you and your family. In 1911, Solomon Boscov arrived in Reading, Pennsylvania, purchased $8 worth of merchandise, rolled his wares into a pack and set off into the surrounding countryside. Soon he established a regular route through Lancaster and Berks County. He sold wares, exchanged merchandise for meals, did chores in exchange for lodging and made hundreds of friends. Within the year Solomon saved enough money to buy a horse and wagon and increase his inventory. Solomon established the first boscov's at 9th and Pike Streets in Reading. Through hard work, honest and loyal co-workers, fair prices and quality merchandise, the small store expanded year after year. In 1954, Solomon's son Albert and son-in-law, Edwin Lakin actively joined the company and the original store was renovated and enlarged. Albert Boscov's love of advertising had an immediate impact on the company as our newspaper ads were enlarged and made more exciting. In 1962, the company began its expansion program with the opening of an exciting, contemporary "Boscov's West" in November. It was followed by "North" in August 1965. Tragedy struck in February 1967 when fire destroyed the original "East" store at 9th and Pike Streets. A new 60,000+square foot "Boscov's East" was opened in Exeter Township in November of that year with much excitement and celebration. But, the celebration was cut short that evening when word reached the Boscov's family, who were busy greeting customers and running registers at East, that Boscov West was on fire. The fire gutted the store. The decision to rebuild West was made after thousands of phone calls swamped the switchboard and letters weighed down mailmen, all pleading "please give us back our store." A rebuilt West opened in November 1968. Once you have find the available Boscovs.com promo code, choose the best Boscovs.com code according to your needs because you can have multiple promo codes for Boscovs.com. You should check any restrictions and policies before applying coupon, such as expiration date, because some coupons are valid for very short period, So if you need a Latest Boscovs.com Promo Coupon / promotion code please BOOKMARK US (Ctrl + D) and check this site frequently. And one important thing some coupon codes are case-sensitive.